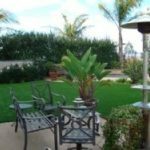 There’s a casual assumption that artificial grass requires no maintenance beyond washing and debris removal. Most people think of artificial turf as a “set and forget” solution, but in fact, while it is less troublesome than grass to maintain, it still requires regular maintenance if it is to be long lasting and durable. Artificial turf first appeared in the 1960s in American sporting stadiums. It consisted of a pile of synthetic fibres coloured to resemble grass and woven into a textile base. Early “turf” provided a much harder playing surface than genuine grass, leading to an increase in sports injury. In addition, ball play became far truer, leading to changes in playing style to which traditionalists objected. Manufacturers responded to these shortcomings by lengthening the pile and introducing a sand infill, which restored the cushioning properties of natural grass, together with its traditional unpredictability as a playing surface. More recently, they have begun using an infill made of granulated recycled rubber. These infills deserve some attention, as they tend, over time, to “migrate” from areas of heavy usage to less frequented areas. In addition, whether sand or rubber, it will over time break down, be carried away by wind, rain or footfall, and need replenishing. The infill has a vital, cushioning effect in turf used as a playing surface, and its maintenance is an important safety measure. As well as concern for the welfare of its users, there are other compelling reasons for adhering to a rigorous maintenance schedule. Organisations such as FIFA prescribe rigorous standards which venues with artificial turf must meet. High Traffic Areas – untended, these will quickly become visibly distinct from the rest of the turf. You can retard this effect by brushing regularly against the nap, to fluff it up. Metal bristles are highly destructive of artificial turf, so use a synthetic bristled brush. Infill – inspect your infill, and make sure any depleted areas are replenished. Stains – the quicker you remove them, the better. Most makes of turf are highly resistant to permanent staining, but don’t push your luck. Soluble stains should be either sponged away either with clean water or with a weak detergent solution. Heavier stains, such as those from motor oil, nail varnish, shoe polish or lipstick, texta or ballpoint ink should be cleaned using mineral spirits. Always make sure that you rinse the treated area well after the stain is gone, to remove all trace of residue. Animal waste – unlike real grass, artificial grass will not be bleached by pet urine. But pet wee is malodorous and should be removed using warm running water. Faecal matter is best left to dry, when it can be easily removed. Residue should be removed with a weak solution of household detergent. If odours persist, treat the affected area with a 50/50 mixture of distilled vinegar and water. Chewing Gum – the best way to deal with this nuisance material is to find a way of freezing it. You can use aerosol refrigerants which you can buy online, or dry ice. Turf Care – a tow-behind range of machinery for tending artificial turf. Its wheel drive means that it requires no external power, and can be towed behind a wide variety of small tractors and quads. If you’d like to learn more about our artificial turf care machinery, send us a contact request here.